African-American activist and renowned writer, Maya Angelou, was born Marguerite Johnson on April 4, 1924, in St. Louis Missouri. Her childhood is described as difficult as her parents divorced when she was just three years old. She and her brother Bailey went to live with their grandmother in Stamps, Arkansas, following the divorce. As an African-American, Angelou experienced firsthand discrimination and prejudices in Arkansas. At the age of 8 during her visit to her mother, her mother’s boyfriend raped her. The man was sent to prison but was released after a day. He was then murdered, possibly by her uncles. Maya was so traumatized by the experience that she remained a virtual mute for five years, constantly thinking that it was her speaking out that caused a person’s death. During World War II, Maya won a scholarship to study drama and dance at the Labour School in San Francisco. She dropped out of school at the age of 14 and went to work as the first female African-American cable car conductor. In 1944, she gave birth to her son, Guy, and had to work several jobs in order to support herself and her son. She met and married a Greek sailor by the name Tosh Angelos. She took her brother’s nickname for her – Maya – and a variation of her husband’s name – Angelou – when she became a night club singer. In the mid 1950s, Maya Angelou landed a role in the tour and production of Porgy and Bess. In 1957, she recorded her first album, Calypso Lady, and she also wrote Cabaret for Freedom. In 1958, she joined the Harlem Writer’s Guild in a bid to hone her writing skills. She got married to Vusumzi Make, a South African civil rights activist, two years later and they later moved to Cairo, Egypt, where she landed a job as the editor for the English Weekly Newspaper. Maya Angelou and her son moved to Ghana where she became the Assistant Administrator for Drama and Music at the University of Ghana. In 1964, she returned to United States and accepted Dr. Martin Luther King’s invitation to serve as Southern Christian Leadership Conference’s Northern coordinator. Angelou was motivated by James Baldwin to start writing about her life experiences. Published in 1970, I Know Why the Caged Bird Sings was her first published book and the first of five autobiography books, each of which tell about her trial and tribulations as a young girl. I Know Why the Caged Bird Sings became the bestselling memoir of 1970 and also made her an international literary star. Angelou became the first African-American woman to produce a screenplay. In 1972, she wrote the drama Georgia, Georgia. Her role in the 1973 play Look Away earned her a Tony Award nomination while her work in the 1977 TV miniseries Roots earned her an Emmy Award nomination. Angelou is well known for her autobiographies, including 1974’s Gather Together in My Name, Singin’ and Swingin’ and Getting’ Merry Like Christmas in 1978, The Heart of a Woman in 1981, and All God’s Children Need Traveling Shoes in 1986. Her other works include Just Give Me a Cool Drink of Water ‘fore I Die, which earned her a nomination for the Pulitzer Award in 1971, And Still I Rise (1978), and I Shall Not Be Moved (1990), among several others. Owing to her interest in health, Angelou has also published a cook book entitled Great Food, All Day Long (2010). In addition to writing books and winning nominations for Emmy awards and Tony awards, Angelou has many other accolades to speak of. In 1993, she was asked to read her poem – On the Pulse of Morning – for President-elect Bill Clinton’s inauguration. 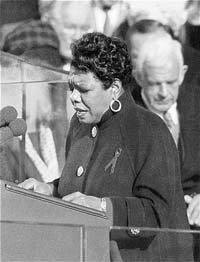 Dr. Angelou has also earned several awards, including the Presidential Medal of the Arts (2000) along with the nation’s highest civilian honor – the Presidential Medal of Freedom, which was presented to her by President Barack Obama in 2011.